This is why you dont trade a goalie if you dont have to. It’s about time I dropped all journalistic pretense and slobbered all over Tim Thomas. Thomas, if you haven’t been paying attention, has been an absolute beast. As of this writing, he leads the NHL in save percentage (.945), goals against average (1.80) and is tied for the shutout lead with five. He has also made a number of insane saves, including this gem against Toronto a few weeks ago. The Bruins wound up losing that night in a shootout, but to be honest, they had no business even getting a point out of that game, if not for Thomas. I felt guilty that night; it was a Saturday, I was out at dinner with some friends, and I could see the game on a TV across the room. And a number of times, I was caught glancing over shoulders and reacting to one insane save after another. That one was one of 38, and despite the loss, I caught myself watching that save repeatedly. Well, to be clear, I’m not going to extrapolate on those individual points anymore than I already have. No, what I want this to be is a simple gesture, a note to point out Thomas’ brilliance this season. In front of a shaky defensive corps, he has played magnificently, making saves that has left jaws scraping the ice in wonder. He’s been the Bruins’ MVP so far, keeping them in a race on nights when they don’t seem to want to play. I was in attendance on Dec. 18 against Washington. After taking a quick 3-0 lead in the first period, the Bruins stopped shooting, putting only nine shots on the Washington net in the final two periods. In the third period alone, Washington woke up and peppered Thomas with 26 shots. He stopped 25 of them. 25 saves in a single game would be solid; he pulled that out in a period. The Bruins hung on for a 3-2 win. So, raise your glasses to Tim Thomas, that trapeze artist hiding behind goalie pads, a white mask and a black-and-gold sweater. Vote to send him to the All-Star game, and take a moment to appreciate the clinic he’s putting on this season. And remember: This is why you don’t trade goalies. Big Z will be in Black & Gold for years to come. In about an hour, the Boston Bruins will kick off their 2010-11 campaign against the Phoenix Coyotes in David Krecji’s backyard, Prague, Czech Republic. I have my jersey out, snacks ready, likely forward lines consumed, salary cap fretted. I am ready to go. But in the event you aren’t, here are five things to at least think about for the upcoming season. Some are warnings, some are fun things to look forward to, and some are mild predictions. Enjoy. As Blackhawk fans know, the $59.4 million cap is nothing to laugh about. The Bruins are currently under, but only to the benefit of Marco Sturm’s recovery from the knee injury he suffered in last year’s playoffs. When he’s healthy, his $3.5M cap number will have to be accounted for, which means someone (Michael Ryder?) will have to go. With Marc Savard out indefinitely due to post-concussion syndrome, the Bruins’ top pick will center a third line between Ryder and Blake Wheeler. Should Savard come back, or if the Bruins acquire another centerman, Seguin will likely ride the right wing with March Recchi and Patrice Bergeron, the much-heralded “Past, Present and Future” line. The Bruins haven’t had a high-profile rookie since Joe Thornton and Sergei Samsonov debuted in 1997-98. Thornton came along slowly, but Samsonov was a blast to watch. It should be fun to watch Seguin grow up. Chara, as of Friday morning, was still hopeful that he could have a new deal before the start of the season, which seems happily optimistic. It’s Saturday morning now, and there’s still no extension, but that doesn’t mean negotiations will go the way of the pumpkin when the puck is dropped at noon, Eastern time. The two sides will likely keep negotiating, as the Bruins are no stranger to signing deals mid-season. Just last year, Tuukka Rask, Milan Lucic and Savard were all made richer after the season started. Bergeron was given a three-year, $15M extension on Friday. Is Chara’s around the corner? UPDATE: Chara has just signed a 7-year, $45M extension. Like, just now. Awesome. There is no one more fun to watch that Lucic, when healthy. Last year was nearly a lost season, with Lucic not returning to form until late in the playoffs, when he became a wrecking ball in front of the net. With the benefit of the off-season, Lucic should be back to full strength and making all those 17-clad fans in the balcony deliriously happy. Tim Thomas’ woes last season were likely due to his hip injury, which has since been corrected via surgery. It’s obvious that Tuukka Rask is the present and the future, but it was also pretty clear that Rask became fatigued as the playoffs wore on. The Bruins have, essentially, two number one goalies, and the common thought is that Thomas should be traded. Why? Their combined cap number is $6.25M. That’s less than the Panthers are paying Tomas Vokoun, the Devils for Martin Brodeur, the Canucks for Roberto Luongo, and so on. This is not a problem, this is a blessing. Have them each play 41 games or so, ride the hot hand in the playoffs, and don’t be afraid to spell one or the other should the team go deep. All that said, I have rosters to print out, hockey cards to pour over, pizza bagels to make and an apartment to tidy up. Here’s to the 2010-11 season, whatever it may bring. How can you not root for Tim Thomas? Tim Thomas has fallen on hard times. Cast aside in favor of soon-to-be-if-not-already-superstar Tuukka Rask, mocked in his home arena over the last two months of the season, reviled for the contract he signed prior to the 2009-10 season, Thomas has become, at best, an afterthought in Boston. It’s easy for fans to move on and forget when a previously loved athlete loses a step or gets lapped by a younger, faster, stronger model. And on that note, it seems especially easy for Boston fans. Nine years ago, Drew Bledsoe felt it when Tom Brady stepped into his void. David Ortiz has been feeling the heat since early 2009 from Red Sox fans. Pedro Martinez became strangely under appreciated after the arrival of Curt Schilling, just as Schilling later heard it when Josh Beckett and John Lester arrived to nip at his heels. And so on, and so on. It’s the nature of competition, but with Thomas, I take the poor treatment a little more personally. Tim Thomas has, by far, my favorite story in hockey. After graduating from the University of Vermont in 1997, Thomas bounced around from the ECHL, IHL in North America to the HIFK in Finland. He signed with the Edmonton Oilers in 1998, and was assigned to the AHL’s Hamilton Bulldogs before going back to Finland. Then, it was back to the IHL, then back to Europe, and, with the Bruins’ organization, he hooked on with the AHL’s Providence Bruins, where I first saw him play. He was a weird goalie. He seemed shorter than his listed 5’11”, he wore a weird mask that wasn’t really a Chris Osgood-style cage, and certainly wasn’t your typical Bauer or Itech mask. He flopped around to the point that you weren’t too convinced he really knew what he was doing. He became a fan favorite with the Baby Bruins almost immediately. He got his first taste of the NHL in four games in 2002-03, wearing a very you-won’t-be-here-for-long number 70 on his back, and played well enough to win three games. In 2003-04, he was stuck back in Providence behind Felix Potvin and Andrew Raycroft, who would go on to win the Calder Trophy as the league’s top rookie. At the end of the season, and at peace with the thought that his chance to play full-time in the league wouldn’t come, he went back to Finland. The impossible became the routine. 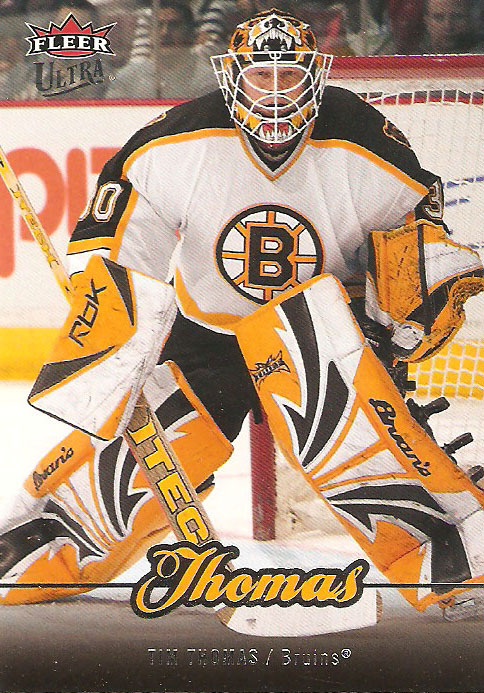 Thomas, he of seemingly no style, was willing the Bruins back to respectability. After every game, he was beaming. He was an NHL goalie. He was rewarded with a three-year, $3 million contract at the end of the year. He’d made it. What followed? 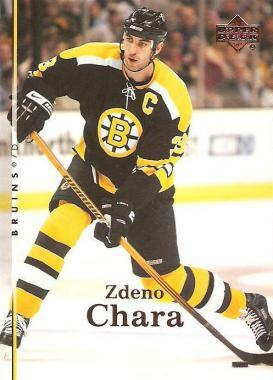 Two consecutive seasons where was penciled in as a backup and emerged as a starter, more incredible saves, and, in 2008, the official resurrection of the team with the help of Zdeno Chara and rookie Milan Lucic, and pushing top seed Montreal to seven games. 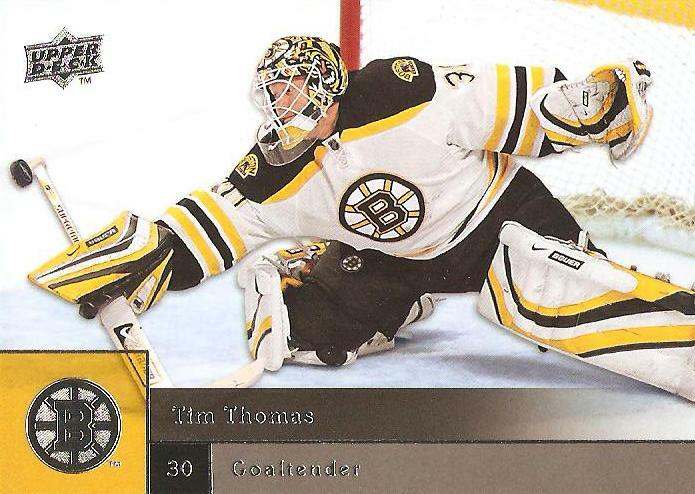 In 2008-09, the Bruins got off to a roaring start, and Thomas had his best year, leading the league in save percentage, goals against, and won the Vezina Trophy. 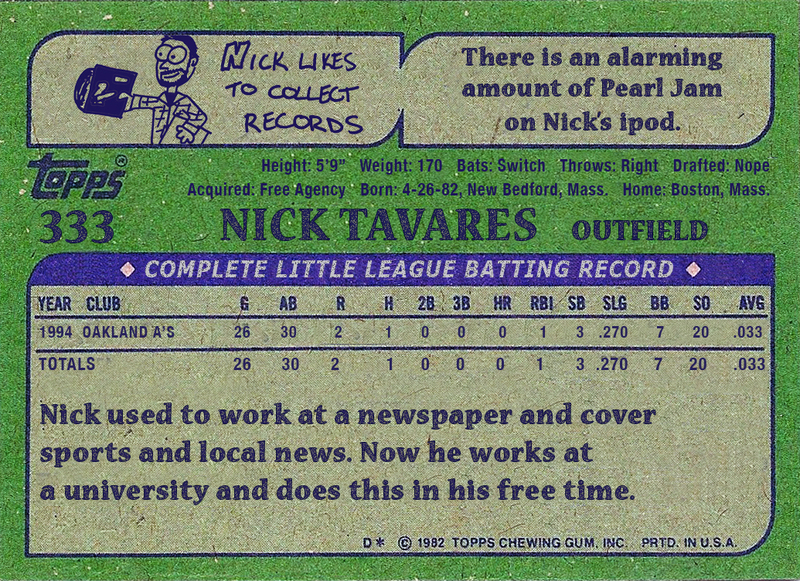 For his efforts, he got his payday, a four-year deal worth $20 million total. That, really, is the root of the angst for Bruins fans. One glance at his 2009-10 numbers (.256 GAA, .915) don’t say “worst goalie in the world.” They’re not at the levels of the previous season, but they’re certainly in line with a strong starting netminder’s. Plus, the Bruins defense was a shell of the previous season (I’m looking at you, Dennis Wideman). But he’s been lifted from games, booed in his home building, mocked by fans as an overpaid has-been. Tuukka Rask has been incredible. He just outplayed Buffalo’s Ryan Miller, arguably the best goalie in the world. With Marc Savard returning, the Bruins could ride his hot hand deep into the playoffs, if things break the right way. It’s his net, and he deserves it. With any luck, it will be his net for years to come. In the meantime, Thomas is the good soldier, working with Rask in practice, knowing he may have played his last game in Boston. Boston fans can be quick to forget. As a group, they toss aside what was old in favor of what is new. Some call this “passionate,” but honestly, this aspect is really just short sighted at best, ungrateful at worst. Thomas hopefully won’t have to play in these playoffs. If he does, it means Rask has either been hurt or imploded, and either would be horrible. Thomas, as much as anyone, knows the net belongs to who plays best, and no one can argue that Rask has displayed an incredible calm this season. He’s been stellar. He’s their best option now. Still, it bothers me that his last memory of being on the ice in Boston will be of getting booed as he’s lifted for Rask against Buffalo. It makes me feel better that he played so well in their last regular season game against the Capitals (and him, too, I’m sure), but that was in Washington. Just before that last home start, I saw him in net against the Calgary Flames. He backstopped at 5-0 shutout, stopping 31 shots. He was the second star of the game, leaving the ice to cheers. He was smiling. If, next year, he’s on another team, I’ll do my best to keep that moment in mind when I see him. But it will be hard not to think of how poorly fans treated him on the way out.